Unsure what to do this weekend? Let me plan it for you. Don't take me too seriously. I can hardly handle navigating my own weekends, and I'd break under the pressure if even one or two readers asked me for help. But I do have an idea, which I found on a fellow writer's blog, Atlanta On the Cheap, just to give credit where credit is due. And it's a web site that any WalletPop reader living in Atlanta should know about. But I digress. This Saturday is Museum Day, sponsored by Smithsonian Magazine and the esteemed Smithsonian Museum, arguably the greatest museum ever and a must-see anytime you visit Washington, D.C.Here's how it works. Across the country, museums are participating in this, this Saturday. Not every museum, but hundreds. You simply either get the September issue of Smithsonian magazine and get your Museum Day Admission card or, for free, go to the Smithsonian Magazine web site and print out the Museum Day Admission Card. Or if you don't want to have to look for the Museum Day section, click on this. And if you want to know what museums in your area are participating, there's a map that'll show you right here. As noted, not everyone is playing. I can't believe how many cool museums in Cincinnati, which is near where I live, aren't on the list, but then there are others that -- well, wow. The Rock 'n' Roll Hall of Fame in Cleveland, for instance. The Sixth Floor Museum at Dealey Plaza in Dallas, Texas -- history buffs familiar with the Kennedy assassination know what I'm talking about. The Sacramento Zoo is participating. 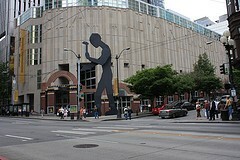 You could go to the Seattle Art Museum (pictured). And many, many, many more. So if the current economic headlines are getting you down, get out there and do something fun and for an entire day, don't worry about money! Editor's note: If you can't make it today, be sure to check out Marjorie Backman's post on other days you can visit museums at no cost.